It's stuff like this that makes me love archaeology. Turns out, we can trace the concept of math homework back to at least 2300 B.C.E., in ancient Mesopotamia. In the early 20th century, German researchers found several clay tablets at the site of Šuruppak. (Today, that's basically the Iraqi city of Tell Fara.) Some of the tablets appear to be the remains of math instruction, including two different tablets that are working the same story problem. A loose translation of the problem is: A granary. Each man receives 7 sila of grain. How many men? That is, the tablets concern a highly artificial problem and certainly present a mathematical exercise and not an archival document. The tablets give the statement of the problem and its answer (164571 men - expressed in the sexagesimal system S since we are counting men - with 3 sila left over). However, one of the tablets gives an incorrect solution. 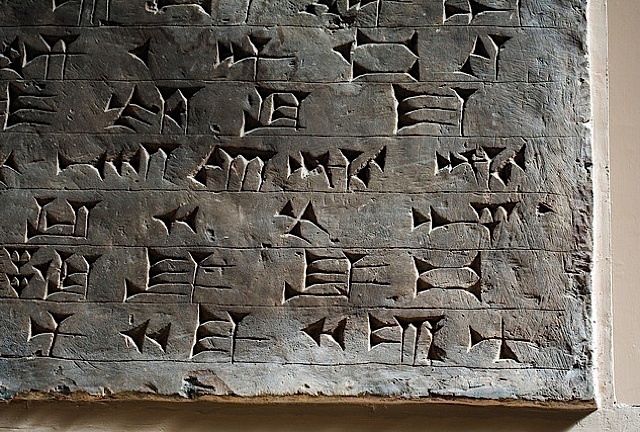 When analyzing these tablets, Marvin Powell commented famously that it was, "written by a bungler who did not know the front from the back of his tablet, did not know the difference between standard numerical notation and area notation, and succeeded in making half a dozen writing errors in as many lines." That comes from a site set up by Duncan Mellville, a math professor at St. Lawrence University in Canton, NY. He's actually got a whole collection of essays on Mesopotamian mathematics. I am certain, that by posting this, I've just ruined somebody's productivity for, like, a week. Image is not THE cuneiform tablet in question. Just A cuneiform tablet. I couldn't find a picture of those specific ones:Marks and signs, a Creative Commons Attribution Share-Alike (2.0) image from nicmcphee's photostream.